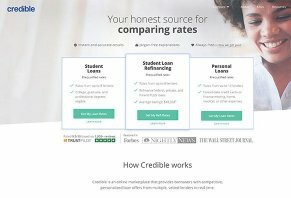 Credible Reviews - Does It Offer The Best Loans? If you’re looking for a place to get multiple quotes for student loans, student loan refinancing, personal loans and mortgage refinancing, Credible offers a no-hassle website that doesn’t sell your information. Credible Review - Does It Offer The Best Loans? Credible is an online lending marketplace where you can find student loans, personal loans and refinancing for student loans and mortgages and as well as cards. The company prides itself on not selling your information to other companies, a big pain point for people who go to websites that provide rates for multiple lenders and pass your information along to those lenders. The site is one of many sites you can go to, fill out a request for loans or loan refinancing and get multiple results of lenders who are willing to offer you a loan at a certain length, amount an interest rate. In this review, we’re going to analyze how Credible works (loans, requirements, etc. ), talk about what they do with your personal information and do a quick comparison of Credible with LendingTree, another site that provides multiple quotes on loans. Along the way, we’ll include a few quotes we garnered from an interview with Credible Business Development Manager Michael Baucus. The company focuses most of its energy on student loans and refinancing, mortgage refinancing and personal loans, Baucus said, but credit cards remain part of their line-up. When you go to their site to apply for a loan, you’ll fill out a form with Credible first. They will do a soft check of your credit to get a basic overview of your financial situation. Once you finish, then Credible will provide you with a list of loans from various lenders. These loans are quotes that include the loan amount, interest rate, repayment period and monthly payment amount. The reason why Credible can provide accurate prequalified rates has a lot to do with the fact that Credible is integrated with credit bureaus and lenders. So, whenever you get quotes, they’re going to be based on legitimate criteria. At this point, you have the ability to choose a lender and complete an application with them, or you can choose to pass on all offers. With the exception of personal loan lenders, Baucus said that the information you provide them never gets passed on to the lenders unless you click on an offer and to continue with a loan application. Personal loan lenders, however, are not permitted to reach out to you until you create an account on their site. “We value our consumer data tremendously. We hold it tightly and never sell it to a third party so they can tele-market you,” he said. Now, keep in mind that clicking through to the lender is not a guarantee that you’ll get your loan or your refinance. Loan decisions take many data points into account, so there could be a chance that the lender won’t approve your loan. Credible’s integration with credit bureaus and lenders would, in theory, weed out most of the applications that won’t meet the lender’s full requirements. According to our conversation with Credible’s Baucus, the site makes money from the lender when a Credible user completes and closes a loan with the lender. This is an important fact because It influences how they run their site. For example, if companies were paying them for leads (interested customers), then their goal would be to get your information out to as many lenders as possible, assuming you’re somewhat qualified for the loans those lenders offer. However, since Credible gets paid when you actually get a loan with a lender, they give your information (in the form of your application) to the lenders that you choose. As for fees, Credible will not charge you anything for using their site. When you go to their site to find a loan, Credible guarantees the student loan refinancing rates they give you are going to be the lowest ones you can get from the lender. If not, they’ll give you $200. As with most guarantees like this, there are a few things you should know about how they determine if you’re eligible for the cash payout. According to their site, the only rates eligible for the guarantee are rates from lenders that aren’t on Credible’s website. Second, you have to get the loan from the other lender...just showing their rates are lower doesn’t count. Also of note is that the information you submitted to get the loan with the lower rate has to be the same as the rate Credible quoted. For example, say your credit score went up significantly after you got your Credible quote but before you got the lower rate quote from the other lender. You may not be eligible for the $200 because your higher credit scores are most likely the reason your rates were lower. Both Credible and LendingTree are sites that use a preliminary form to suggest lenders to you based on the financial information they glean from you. On the back end, LendingTree is paid by lenders to get leads, whereas Credible gets paid when you actually close a loan with someone. Therefore, there’s a chance that consumers who do a preliminary application with LendingTree will receive numerous phone calls from the lenders who work with the site. For example, I did a preliminary application on LendingTree for a mortgage in 2015. My family was living abroad and we were moving back to the United States, so I wanted to check on mortgage rates. I used my mother-in-law's phone number for the application. I didn’t quite know what I was getting into when I finalized my application. Within minutes, a surge of lending emails appeared in my inbox and my mother-in-law received a slew of phone calls from lenders who essentially paid to get my information. Now, to LendingTree’s credit, the lenders who called us had loans that were tailored to our situation. However, I and my mother-in-law found the constant emails and phone calls to be pretty annoying. The main advantage that LendingTree offers you is that they have a considerable number of financial products for which they can offer quotes from multiple lenders. At the time of publishing, they offered 12 different financial products, including insurance, student loans, home loans and auto loans. Based on our research, we think that LendingTree is the more comprehensive site. However, Credible’s commitment to releasing your data only when you choose a loan provides the distinct advantage of privacy and helps you avoid a steady stream of calls from lenders who want your business. Our research of Credible indicates that their rules of sharing your data will protect you from unwanted calls and emails from lenders. This is a big deal if you’re in the early stages of finding a loan or loan refinance and you want to take things at your own pace. We also like how Credible integrates with credit bureaus and lenders. This way, there’s a good chance that the rates you see after you fill out your form on Credible will be the rates you get when you finalize your loan. The downside of the site is that it’s not quite as comprehensive as other sites that pull together quotes from multiple lenders. Also, they don’t have nearly as many loan types and financial products as a site like LendingTree. Write a Review for Credible!